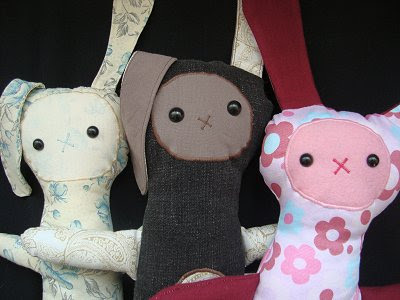 These 3 little guys - Murial, Blake and Peggy to be exact, are now available here! My favourite would have to be Blake. Please note for international customers, yes I do post internationally. This website (http://www.xe.com/) is the quickest way to do currency conversions. Some softies are under 20 USD including postage! A great way to start getting organised for Christmas (dare I say it!). Very cute. Love their x noses. I really love your softies. Each one has its own personality.